The highly anticipated biggest heavyweight boxing fight in the United States since 2002 takes place tonight at the Staples Center in Los Angeles California when WBC champion Deontay Wilder faces former unified champion Tyson Fury. 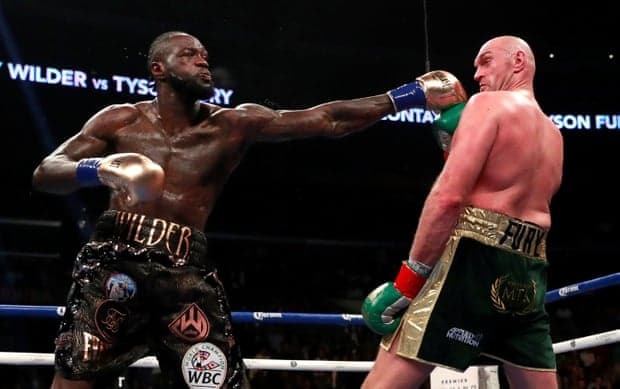 Wilder (40-0, 39 KO) passed the toughest test in his last fight back in March where Deontay Wilder scores the biggest win of his career after stopping Cuban knockout artist Luis Ortiz in the 10th round at Barclays Arena in Brooklyn. Wilder is the best puncher in the boxing no question here. He knocked out every opponent he has faced and in a brutal fashion, with his right hand. Wilder has defended his title seven times as a result of that power before going into tonight’s fight. Fury (27-0, 19 KO), 30, who has won a couple of tune-ups fights after being back from long hiatus due to a failed drug test, substance abuse problems as well some mental health issues. Before that Fury defeated the longstanding reign of Wladimir Klitschko back in 2015 in one of the more stunning upsets in recent years. Both heavyweight fighters have combined 58 knockouts in their 67 career fights! Tonight’s fight delivered on all levels, Wilder and Fury went to absolute war. Tyson Fury enjoyed the upperhand for much of the fight, Deontay Wilder put him down in the 9th and 12th rounds to rock back into contention. One judge awarded the fight to Wilder 115-111, one had it 114-110 to Fury and the other had it a 113-113 draw. Scorecards: 115-111 Wilder, 114-110 Fury, 113-113. It’s a split draw! Both fighters believed they won!! !